Genomic biomarkers are increasingly being used for detection of cancer, for recognizing early disease recurrence, or for providing crucial molecular findings essential for the use of novel classes of targeting therapies. Although there is considerable enthusiasm for the use of the discoveries of cancer genomics for personalized medicine in clinical practice, the number of new classes of biomarkers incorporated into cancer diagnosis and treatment remains surprisingly low. 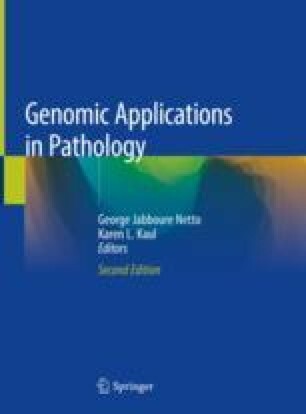 In this chapter we describe how novel laboratory approaches and research discoveries usually move into pathology practice, and we consider why uptake of genomic biomarkers in clinical medicine has been so slow. We illustrate this by describing some of the genomic biomarkers and newer sequence-based genetic tests that are being successfully used in pathology practice now. We draw attention to some of the challenges faced in delivering practice-changing discoveries for effective use in precision medicine and discuss the potential impact of genomic biomarkers on the design of new clinical trials. Finally, we review current guidelines and recommendations for moving a successful biomarker from the pathology research laboratory into clinical practice. Strategy for Patient-Oriented Research-CIHR. http://www.cihr-irsc.gc.ca/e/41204.html. Accessed 10 Feb 2013. NCI dictionary of cancer terms-National Cancer Institute. http://www.cancer.gov/dictionary?cdrid=45618. Accessed 10 Feb 2013. Foundation for the National Institutes of Health. http://www.fnih.org/work/key-initiatives/biomarkers-consortium. Accessed 10 Feb 2013. College of American Pathologists In Vitro Diagnostic Multivariate Index Assays (IVDMIA). http://www.cap.org/apps/cap.portal?_nfpb=true&cntvwrPtlt_actionOverride=%2Fportlets%2FcontentViewer%2Fshow&cntvwrPtlt%7BactionForm.contentReference%7D=committees%2Ftechnology%2Fivdmia.html&_pageLabel=cntvwr. Accessed 01 Jul 2017. Oncotype DX official website. http://www.oncotypedx.com/en-US/Colon/HealthcareProfessionals/RecurrenceRisk/ScoreResult. Accessed 01 Jul 2017. Oncotype IQ Official website. http://www.oncotypeiq.com/en-US. Accessed 01 Jul 2017. Abbot Molecular official website. https://www.molecular.abbott/int/en/products/oncology/vysis-alk-break-apart-fish-probe-kit Accessed 01 Jul 2017.